Approaching the north end of the High Line, Gary and I came upon a large construction site with lots of exposed ironwork and more cranes than I’ve ever seen before at a single site. These bare lights caught my eye and looked interesting dispersed in the naked steel skeleton. Great indeed with those lights. Nicely seen. Thanks Jonne. It was an amazing site but we couldn’t get close enough for me to get square with it, there were fences and blocks because of all the cranes overhead. I’ll post an image of the cranes, there were at least 8 of them at this one site. I’ve never seen so many. 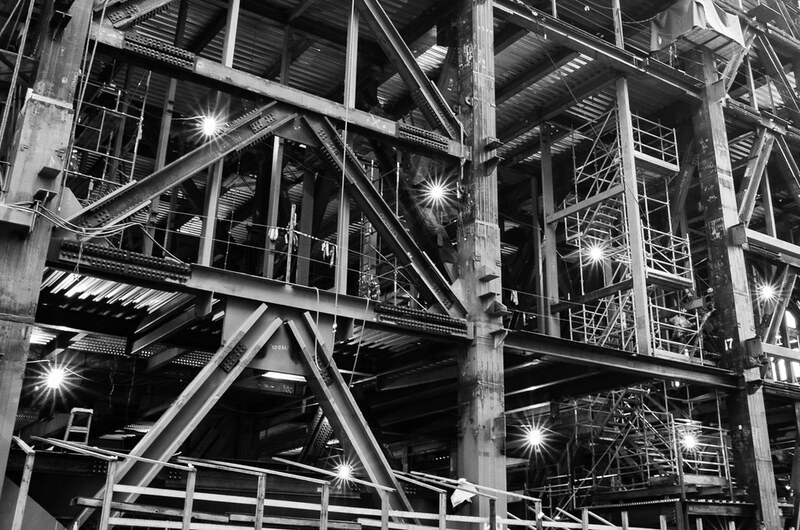 Great eye on those lights, Richard, and very captivating images from that fascinating construction site. That sure was a fun ramble with you in NYC! Thanks Gary. It was a fun day.